Well, I had hoped that Lenovomoto would circle back to their original battery-size philosophy with zPlay 3, but I guess not. With slightly more screen real estate at 6" and the same 3000 mAh battery as the Z2, I'd imagine that we'll likely get a little less usage time on a charge than the second gen phone. Moto snatched away the one thing that was supposed to make the Play what it was. Dumb. My OG Play works great at least. Gives me reason to wait and see if the OnePlus 6T gets a boost in battery size and other essentials later this year. If so, I may make that my new DD. I think they are aiming for thin, to help keep the phone from being bulky with Mods on it. And the newer chips seem to be much more battery friendly. My wife's Z2 Play gets just as good of battylife as her Z Play did; or at least seems to. I am definitely buying a Z3 Force this Summer, smaller battery & all. I'm hoping it runs as smooth as I have heard about the Z2 Force and the newer chip provides decent battery life. The Force is only a Verizon phone right? That observation about your wife's Z2 battery life is both reassuring and surprising 🤔. When the Z2 came out with a smaller battery and lost the ability to create a custom launch phrase I just decided to skip it altogether. I really do like the mod system and would prefer to stay with it. But I was hoping for a small battery bump up to say 3300 or 3400 at least. I hear a lot of arguments about efficient chips and im sure on some level there's truth to it, but I also feel like the manufacturers just claim it to ease nerves about big screens and comparably small batteries. We have a custom launch phrase setup on her Z2 Play. It works fine. I honestly don't mind the "bulkiness" of the original Z Play. I had a LG G3 prior and that was a pretty thin phone at the time and I always felt like the slightest drop was going to destroy it. The Z Play felt more solid in my hands and battery life is ultimately the most important feature to me. I might be looking for something new later this year so I'll see what the reviews of the ZP3 are like. Mod note: Moved from Z Play forum to Rumored Device forum, pending Z3 forum creation. Battery capacity isn't the end all, be all. My Z2 Play at 3000 mAh runs laps around my Z Force Droid at 3500 mAh (when it first launched). My Z2 Play keeps pace with my brother's Z Play Droid. I'm expecting the Snapdragon 636 to perform more efficiently than the Snapdragon 625/626. 6T runs 845, right? That's not going to sip power as well as the 6XX. You've also probably wrecked your Z Play's battery life prematurely with that Power Pack mod. I'm still on the original Moto Z Play and I'm not upgrading just yet. I'm upset they are rumored to still have a 3000mAh battery size like the Z2 Play. I tried it out for a few weeks and it didn't last as good as my original. Voltage depression? You could be right, Ry. But I wouldn't know. The battery hits 80%, the mod kicks in, and I don't think that mod has once dropped below 50% before the whole device is plugged in again in the run up to sleep. 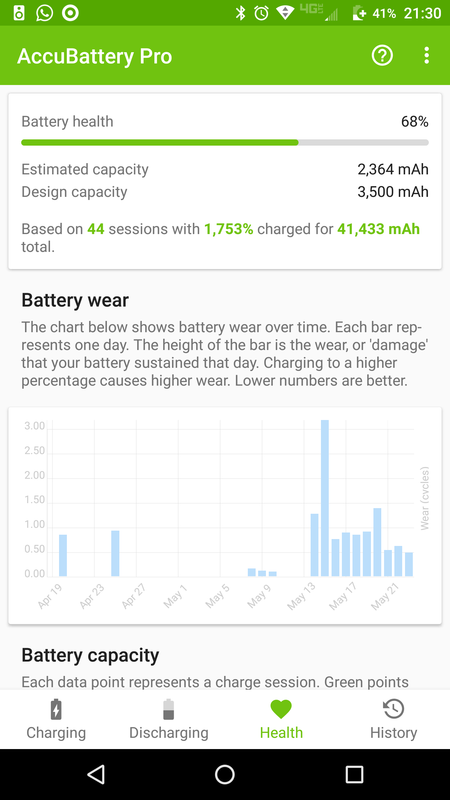 If the stock battery has lost a month or two of it's overall lifespan due to the mod, I consider the trade off (i.e., zero day-to-day battery anxiety) to be well worth it. 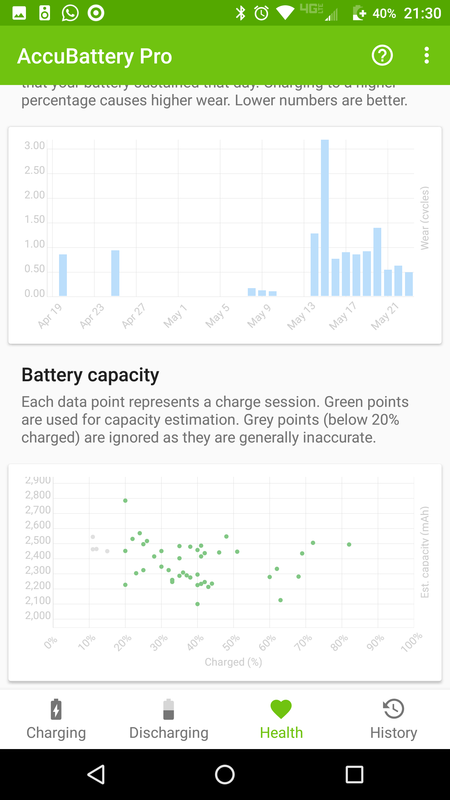 Since the iPhone throttling controversy, I've been curious about battery health on my devices. 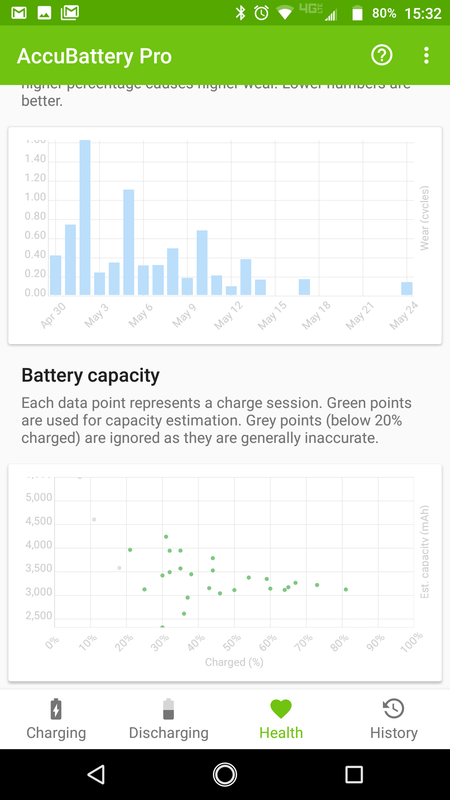 Here's what AccuBattery is estimating for my Z Force Droid. Not much data, just recently started using this app and have been switching between this Moto Z Force Droid and a Moto Z2 Play. 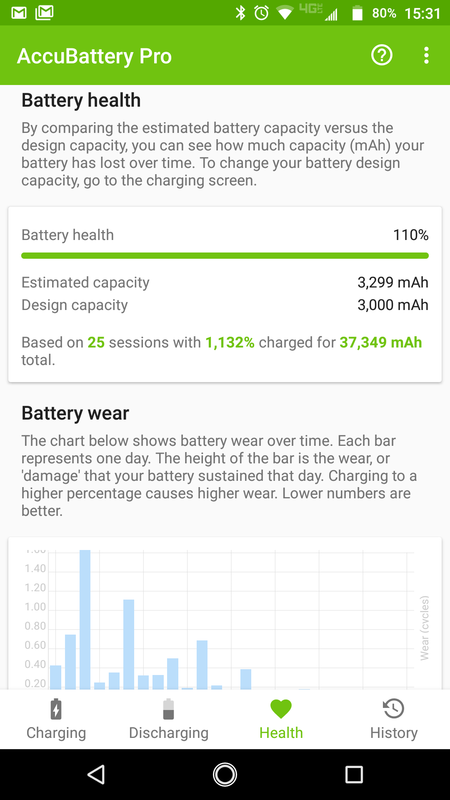 And here's what AccuBattery is estimating for my Z2 Play. I'm glad Motorola finally updated the battery mods so that you can turn them on/off. Doing more research on batteries, I would love for the option to say "charge to 80% and stop and don't start charging again until at 40%". How did you do this, please? why is my earphone port playing up?